Delran's Daniel Strohleinl (3) and Northern Burlington's John Wainwright (24) chase a loose ball during the second half of a high school boys soccer game, Thursday Oct. 19, 2017, in Delran, NJ. Kendell did not play against Northern Burlington. Delran won 3-0. Trailing by a goal at halftime, the Haddon Township girls' soccer team erupted for six goals in the second half Tuesday to defeat Holy Cross, 6-1. Danielle Bishop and Olivia Oyola each recorded two goals for the Hawks, while Sydney Farnham contributed a goal and two assists. Lindsey Getzinger and Calista Burke split goalkeeper duties, stopping a combined nine shots in the win. Heather Russell led Northern Burlington with a goal and an assist as the Greyhounds blanked Atlantic County Tech, 4-0. Nina Burden, Victoria D'Imperio, and Cheyenne Lewis all added goals for the victors. Grace Walter made 10 saves for Rancocas Valley to preserve a 1-0 victory over Cinnaminson. Ava Saric delivered the game's only goal for the Red Devils. Washington Township defeated Sterling, 3-0, behind a two-goal effort from Brett Guetens. Chad Yates chipped in a goal for the Minutemen. Washington Township boys’ soccer gathers together after a 3-0 win over Sterling. 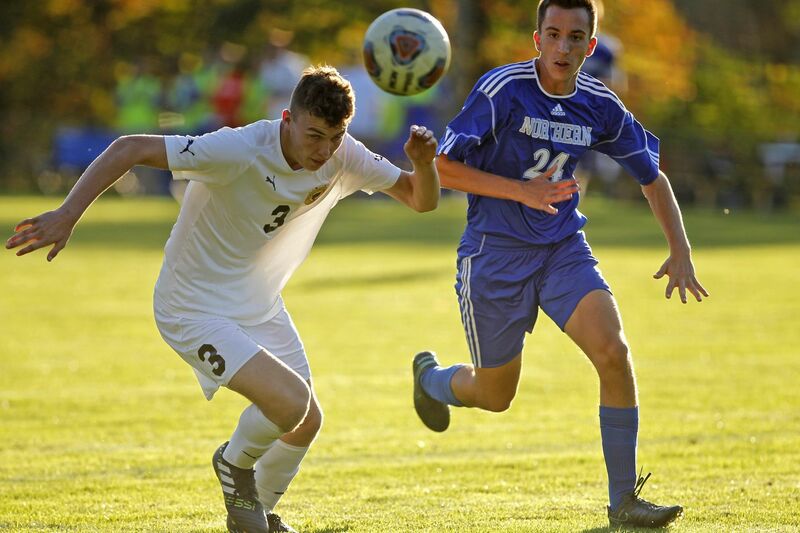 Jayson Vandermark scored two goals in Delran's 3-0 triumph over Burlington Township.. Daniel Strohlein added a goal as Ryan Howlett earned the shut out with four saves.